Get a large pot of water to a boil, and once it bubbles add in a handful of salt and your pasta. Stir the pasta around and set a timer. While the pasta cooks, combine the pistachios, parsley, and garlic in a small food processor with a pinch of salt. Add 1 TBS of olive oil and process. Scrape down the sides of the bowl, add another TBS of olive oil and process again. Repeat until you have used all of the olive oil. 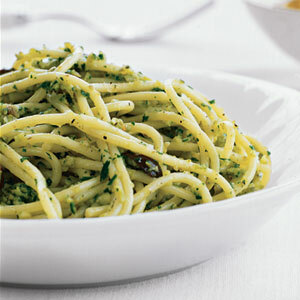 Scrape the pesto into a serving bowl, stir in the goats cheese, the lemon juice, and 1/4 cup of the pasta cooking water. Add salt and pepper to taste, toss in your hot cooked pasta, and savor a delicious dinner! I like to hand-tear about a cup of very coarse bread crumbs, fry them up crispy in 1 TBS olive oil, and toss them into the pasta at the last minute. Make It Your Own: try adding green olives, roasted or fresh sweet bell peppers, cherry tomatoes cut in half, or grilled and chopped zucchini.